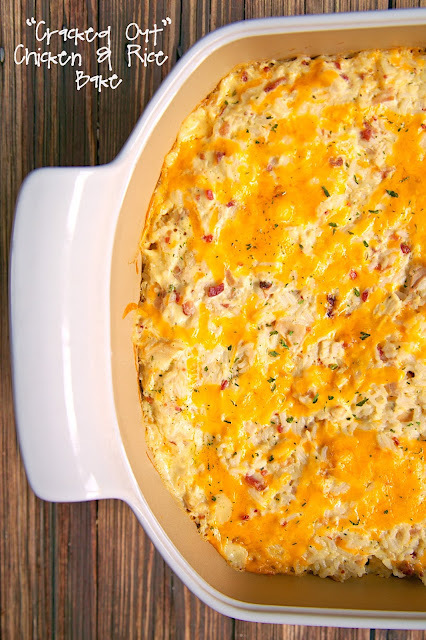 Cracked Out Chicken and Rice Bake - chicken, cheddar, bacon, Ranch and rice - quick and easy weeknight casserole! Use rotisserie chicken and this comes together in 5 minutes! SO good! We make this at least once a week!! I've been on a rice casserole kick lately. We've made several versions of it and loved them all. 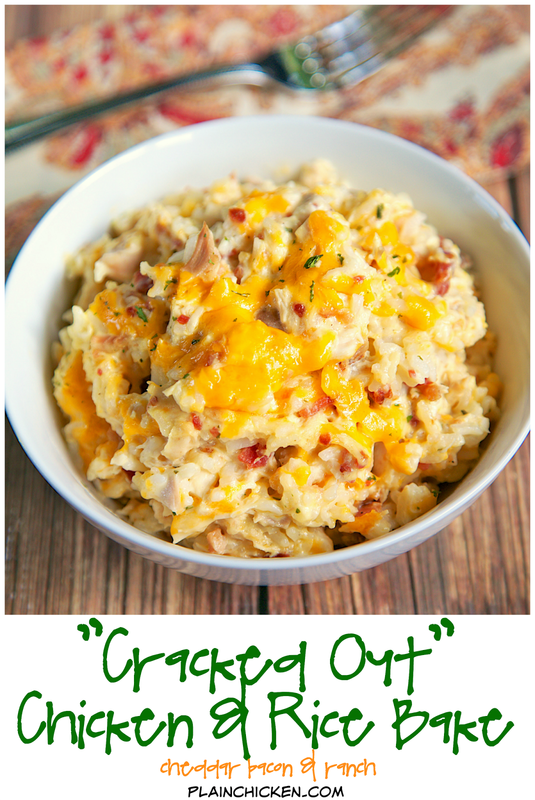 I was looking thorough my recipes and realized that I didn't have a "Cracked Out" Chicken and Rice Bake version. OMG! I had to remedy that situation ASAP! This was SO good. I mean, seriously delicious! 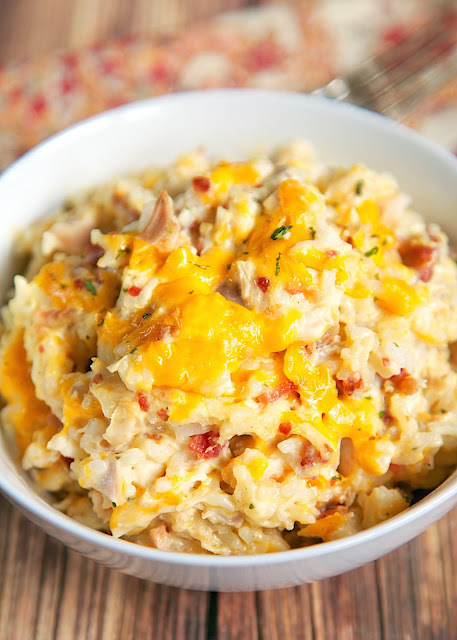 It might be my favorite Chicken and Rice Bake on the blog. We ate this for dinner and had leftovers for the next day for lunch. It was great both times. Use some rotisserie chicken (my weeknight secret weapon), and this casserole is ready for the oven in 5 minutes. Serve this with some quick green beans and you have an easy weeknight meal in under 30 minutes! In a large bowl, combine chicken, chicken soup, sour cream, Ranch dressing mix, cheddar cheese, bacon, chicken broth and cooked rice. Spread into prepared pan. If I were to use already cooked long grain white rice, would you say maybe 4 cups? I'd also like to know. Have a pantry full of various rices, but no instant. Approximately how much cooked rice do you need? I'd like to know also. I have a pantry full of various rices but no instant. How much cooked rice should be used? Yes - 2 cups of instant rice = 4 cups cooked rice. I made this last night. It was super easy and delicious. I had purchased a rotisserie chicken and shredded it over the weekend. Which made this really easy to throw together. Will definitely add this to my rotation! I might add mushrooms to this and a bit of red pepper for some kick. What can I use instead of dry ranch dressing, They dont sell that where I live in the Canary Islands. Does the rice measurement refer to cooked or uncooked? For example, should I put 2 full cups of uncooked instant rice into the boiling water, or should I put enough uncooked instant rice into the boiling water so that when it is fully cooked, it will result in 2 cups of cooked rice? Put 2 cups of uncooked instant rice into the pot. I just made this for dinner and it is AMAZING! Thank you so much for the recipe! Is there a reason to use instant rice over regular uncooked rice? If I were to do regular uncooked rice what would the measurements be? I prefer instant rice because it only takes 5 minutes to make. I don't want to spend a lot of time making the casserole. 2 cups of instant rice = 4 cups cooked rice. This looks great! Can you sub out the uncooked instant rice for uncooked regular rice? Is there a reason you prefer instant rice over regular rice? Would it be the same amount of instant rice v. regular rice? Thanks! Is this something that can be frozen and reheated? If so, what temp and time would you reheat it for? Thanks! It could be frozen unbaked and baked according to the directions once thawed. I made this with long grain rice but used spicy ranch dressing mix. I also added some cumin, chili powder, chili seeds, pepper, onion salt and just to make it spicy enough for my husband 1/4 cup hot pepper sauce. It was delicious. I will definitely be making this one again. This looks so good! I am definite putting it on the menu for next week. I featured your recipe in my Saturday Morning Coffee Cafe this week! I'm attempting to make this into a crock pot recipe by using raw chicken and regular uncooked rice. Starting at 4 hours on high and giving it a whirl. Going to add the cheese and bacon towards the last 30 of cook time. I've incorporated extra water/stock for the rice to cook with the chicken in the crock pot all together. This looks great and tasty, but I'd rather not precook everything and then still heat up the oven, so I really hope this works out. Will let you know. I added baby bella mushrooms and broccoli florets, as well as chopped onion. Came out absolutely awesome. Thank you!